Sat Aug 2nd 2014. Tickets £7 online or £9 on the door. Concessions for students and over 65′s £6 online or £8 on the door. Have you ever heard contemporary big band jazz at CICCIC? 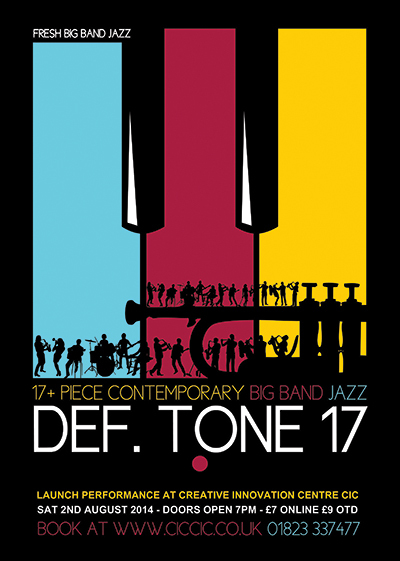 If not then you’ll be amazed by this exclusive concert by newly formed Def. Tone 17. A new 17 piece band is born – first ever gig taking place at Creative Innovation Centre in Taunton on Aug 2nd. As well as hearing from this amazing contemporary big band jazz we also have a surprise supporting band to make the whole night a fresh music experience in one of Taunton’s well respected music and culture centre’s.